Grandchildren are special blessings. And they grow so fast. As a long-distance Gramma, I am amazed at how quickly they grow between visits. I have many photos of my grandchildren but those photos are all digital. There is nothing wrong with that at all. After all, it's fun to be able to change the desktop photo from favorite photo to the next favorite photo. However, recently I've had a desire to have printed photographs in frames on display. I've started to narrow down the frame choices and I am sharing a couple of these wonderful picture frames with you. This desktop photograph frame has good reviews. It is simple yet unique. 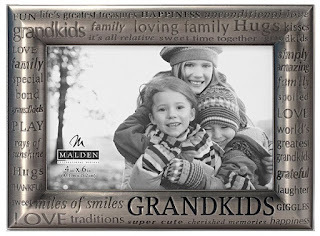 It visually displays exactly how I feel about my grandbabies - a metallic word "Grandkids" followed by a heart. I like that this desktop frame isn't a typical frame with four sides. And that it has a base. I think it is a perfect frame for the office. An interesting way to display photos on my desk or file cabinet. 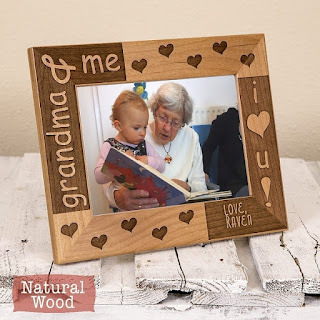 A wonderful gift idea is a photograph of the baby in a "Best Gramma" frame. Or, even better, in a personalized frame. These wooden frames are handmade. This is the "natural wood" color choice, but there are several color options. You can also specify the name - "Grandma", "Gramma", "Nana" or something else. And note the personalized "love, Raven" on the bottom right corner. How much fun is that? 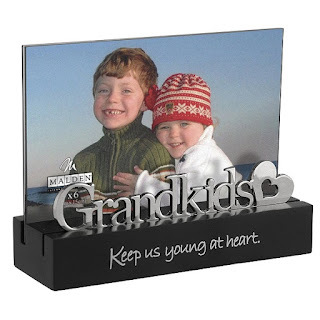 Each grandchild can send their own framed photograph to grandparent. 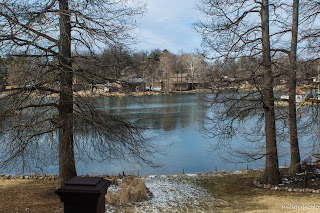 During my next visit with the grandbabies, I am sure to take many photographs. That is a given. But this time I will print some and display them in frames. Do you know someone who loves books and photography? If so, I have the perfect gift idea for them. I too love both books and photography, so reading about photography is a natural for me. My favorite series of photography books are written by Scott Kelby. Scott gives tips to the reader as if he were on a photo shoot with them. He doesn't bore you with tons of details but rather gets right to the point and says "try doing it this way". Whether you are a someone who just likes to take photos for fun or you are a new or not so new photographer trying to get the most out of your photos, Scott has some great tips for you. I invite you to look over the books on this page and then think about those people on your gift list. I bet you have someone who would really love these books! This book was my first introduction to Scott Kelby and I can tell you the pages are getting rather worn from all the times I have read and looked at this book. I love the way Scott gives you step by step instructions on how to perform various photography skills. Scott starts out the book with a basic chapter on telling you how to get really sharp photos. The following chapters tell you how to shoot like a pro whether you are shooting flowers, weddings,landscapes,sports, or people. Scott also includes chapters on avoiding problems, traveling with a camera and printing. All of these chapters are great and the way they are designed you can review a certain chapter right before you are going to shoot that subject. The last chapter in the book shows beautiful photographs and then gives you the formula for shooting the photo. The book has great, easy follow instructions. 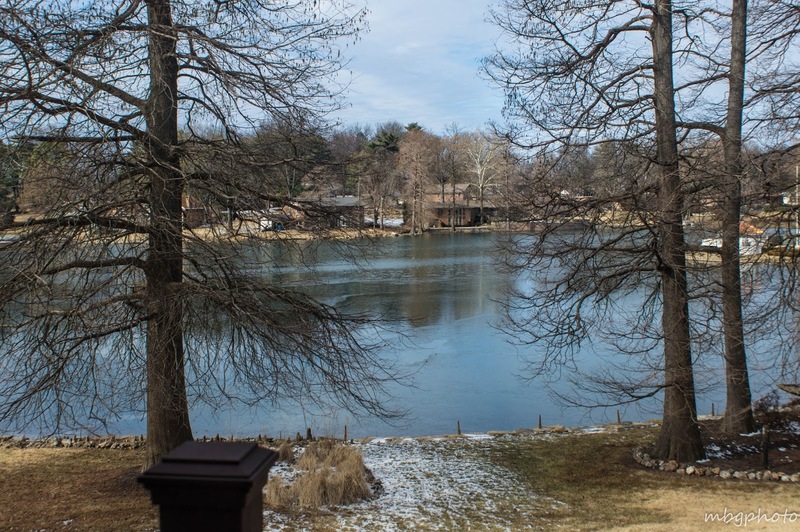 This photo used a tip found on page 62 of The Digital Photography Book . It is entitled The Golden Rule of Landscape Photography and states a landscape photographer can only shoot during two times each day; dawn and dusk. Book two is written in the same format as book one and gives you many more great tips for photography. It adds a chapter on using flash, one on setting up a studio and a great chapter on shooting portraits. In addition it has chapters on landscapes, weddings, travel, and macro that give you more great tips on these subjects. One of my favorite tips from this book is found in chapter 4 on page 114 where it tells you not to stop shooting after sunset. It states if you are patient and wait, after many of the photographers have packed up their bags, you will capture some magnificent shots. On many nights just after sunset the sky turns a deep,deep blue and beautiful colors appear. These will only last for about 10-12 minutes so you must be ready. In September, I went to the grounds of a nearby college and I was shooting sunflowers at sunset. I had gotten some great shots, but then I remembered the tip about waiting around after the sunset for the great colors in the sky. I waited about 10 minutes and the sky broke out in beautiful colors. There was a fountain nearby and I photographed the beautiful sky reflected in the water of the fountain and pond. The resulting photo is seen below. Volume 3 picks up where book 2 stopped. It has two more chapters on using a flash and using your studio. This book also has a great chapter about tips to using different lenses. it tells which lens to use under different circumstances. It also includes chapters on shooting products, people, outdoors and sports. I have always found the fisheye lens to be fascinating, but was never quite sure when to use it. In chapter 3 of this book, Scott explains that he like to use a fisheye lens if he is sitting up high in a sports stadium and if he is shooting skyscrapers and wants to get them all. This book is on my wish list for Christmas. It has great reviews. It picks up where volume 3 leaves off. One of the reviews I read said that if you are a beginner you will want to start with volume 1, but for the more advanced photographer part 4 is by far the best of the group. I can't wait to delve into this book. This set contains volumes 1-2-3-and 4. It also includes a new #5 that I have not read yet. It would make the perfect gift for the photographer on your list. 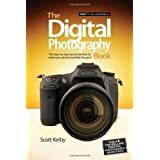 Whether they are a beginner or someone who is more advanced, they are sure to find helpful hints in Scott Kelby's series of digital photography books. Do you have a favorite photograph that you would like to use for a gift? How about turning it into a puzzle? 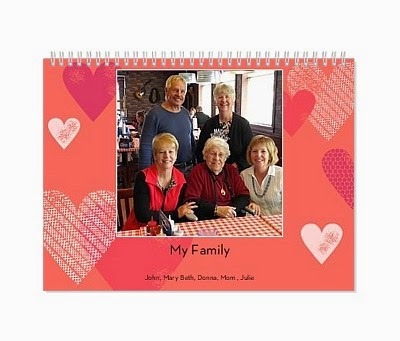 You can make your own puzzles on the Zazzle website or you can choose from a wide variety of puzzles that Zazzle shopkeepers have listed on their pages. You might choose a favorite photo from a trip or perhaps a photo of a flower from your garden. Another great use for the Zazzle puzzles is to make a puzzle for a child with a photo of them on the puzzle. The puzzle above was made from a photo I took of Cape Hatteras lighthouse in North Carolina. This lighthouse is often called "America's Lighthouse". I love the black and white spiral stripes. It looks very classic. Zazzle puzzles come in two different sizes. The 8x10 size has 110 pieces and the 10x14 size has 252 pieces. All of the puzzles are made of sturdy card stock and are mounted on chipboard. They come in gift boxes and are easy to wipe clean. Here are some more puzzles I have made of my favorite subject Lighthouses. The first one is on Hilton Head South Carolina. This is a fairly modern lighthouse, having been first put into service in the 1960's. It is often seen as the iconic symbol of Hilton Head. The next puzzle has a photo of Split Rock lighthouse in Minnesota. This lighthouse sits high on a rock overlooking Lake Superior. Nova Scotia has many beautiful lighthouses. I photographed this one at Peggy's Cove. It is said to be the most photographed lighthouse in Canada. Mugs are great gifts for everyone on your gift list. They come in all sizes and shapes and can be customized for your recipient. Take a look at the blue hydrangea mug below. This is one I made on Zazzle with a photograph I took of my daughter's hydrangea bush. Wouldn't it be great for the flower lover on your gift list? Zazzle has mugs available in a variety of designs or you can design your own mug. The mugs are dishwasher and microwave safe and come in 11 and 15 oz sizes. Just click on the link above to order a pre-made mug, there are hundreds to choose from, or customize one of your own. Now that you have picked out a mug, how about filling it with goodies to present as a gift. Here are some suggestions for fillings. Packages of hot chocolate mixes, small bag of marshmellows, and a few cookies. Zazzle also has a line of travel mugs that are great. These 15 oz. mugs have a spill proof lid and are great for people on the go who like to take their favorite beverage with them. Design one of these mugs with a photograph of a favorite hobby or perhaps someplace your visited in the past year and you have a real winner. I love to travel and photograph lighthouses so this lighthouse mug of Round Island lighthouse in Michigan is a favorite of mine. Several of the writers on Review This also have Zazzle stores. Here are some favorite mugs created by the RT staff. Order custom mugs on zazzle.